Service to others is a core value of our country. U.S. presidents throughout history have been instrumental in creating the programs to support national service. 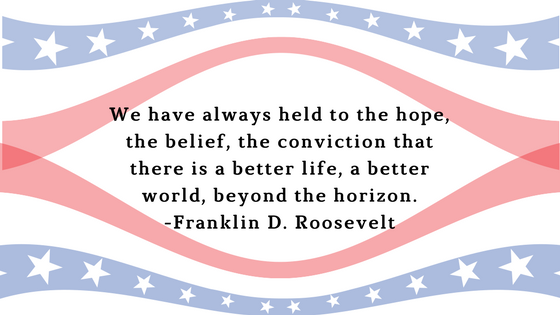 This President’s Day, we remember presidents, starting with Franklin D. Roosevelt, and their contributions to National Service and AmeriCorps. Franklin D. Roosevelt signed an executive order on April 5, 1933 and created the Civilian Conservation Corps as part of his New Deal legislation in response to the Great Depression. This monumental initiative not only employed around four million young people, but also helped shape the national and state park systems we enjoy today. Some of the accomplishments of this program include, planting over 3.5 Billion trees, constructing trails and shelters in more the 800 parks nationwide and clearing and maintaining access roads. In 1942 when World War II began, the Civilian Conservation Corps was dissolved to utilize all resources for the war effort. Fortunately, this program was highly regarded among the public and eventually inspired the creation of the AmeriCorps National Civilian Community Corps (NCCC) in 1992. John F. Kennedy signed an executive order on March 1, 1961 that established the Peace Corps. Through this program over 200,000 Americans have served, in over 141 countries, in the pursuit of promoting peace and assisting developing countries with self-sustainability. 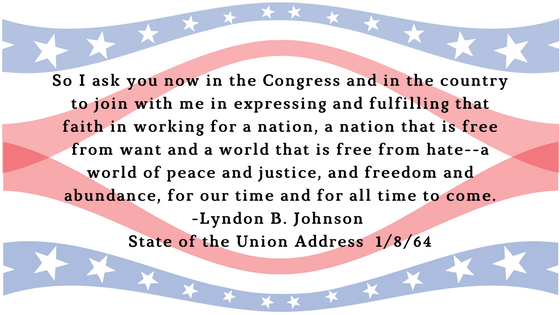 Lyndon B. Johnson brought the spirit of the Peace Corps home to America by creating the Volunteers in Service to American (VISTA) in 1964 as part of his War on Poverty. VISTA is an anti-poverty program that focusing on enriching educational programs and vocational training by enlisting Americans in one year of service. There are currently over 5,000 AmeriCorps VISTA members serving in over 1,000 projects throughout the nation. In 1993 this program became a part of AmeriCorps. President George H. W. Bush revived interest in national service. In 1990 Congress passed the National and Community Service Act, which created a Commission on National and Community Service and sought to “renew the ethic of civic responsibility in the United States.” Full implementation began in 1992, when the commission awarded $64 million in grants to support four broad types of state and local community service efforts. President Bill Clinton sponsored the National and Community Service Trust Act, a revision of the National and Community Service Act of 1990, which was passed by a bipartisan coalition of Members of Congress and signed into law on September 21, 1993. The legislation created a new federal agency, the Corporation for National and Community Service (CNCS), to administer federally funded national service programs. The law created AmeriCorps, which was designed to support local, state, and national organizations across the nation that involve Americans in results-driven community service. In his State of the Union address on January 29, 2002, President George W. Bush called on all Americans to serve their country for the equivalent of two years. A coordinating council housed at the White House and chaired by the President worked to expand and strengthen federal service programs like the Peace Corps, Citizen Corps, AmeriCorps, and Senior Corps, and to raise awareness of, and break down barriers, to service opportunities with all federal government agencies. President Barack Obama also supported national service with the call “United We Serve.” He worked with Congress to pass the Edward M. Kennedy Serve America Act in 2009. In 2013, he created the Task Force for Expanding National Service to engage more Americans in results driven service; expand economic and educational opportunities for those who serve; enhance federal agencies’ capacity to achieve their missions and more efficiently use tax dollars; and build the pipeline of Americans ready to enter public service. In total, more than $194 million was invested in this approach resulting in 10,000 new AmeriCorps positions. Today, AmeriCorps, which is funded by the Corporation for National and Community Service (CNCS), engages more than 80,000 people in intensive service each year through more than 15,000 nonprofits, schools, public agencies, and community and faith-based groups across the country. Nevada’s 150 Points of Light!